The Superior General of the De La Salle Brothers, Robert Schieler has singled out Papua New Guinea's long standing commitment to teacher education as one of its greatest contributions to the global Lasallian family. Br Robert has received a warm welcome from Lasallians from across PNG during a visit this week to teachers colleges, schools and Brothers communities in Hohola and Bomana. The Superior General was greeted by traditional dancers at Sacred Heart Teachers College, where he delivered a keynote address, urging trainee teachers to never lose sight of the importance of collaboration in their careers. "St John Baptist De La Salle was a pioneer in the 17th century because he recognised early on the importance of educators being part of a community, rather than working on their own", Br Robert explained to the staff and students. "And he lived in an era without all the great technological advances today, in areas like social media for example, which effectively allow for sharing resources and professional collaboration across the globe". "As a teacher, it's also critical to not play favourites and to ensure that our efforts are directed towards the needs of all students, regardless of their ability", Br Robert added. Students presented Br Robert with a handwoven hat in PNG national colours, before they joined in unison in singing the national anthem and the college song. After a brief meeting with the teachers' college principal, Theckla Aknonera, Br Robert continued alongside Pacific Asia Regional Councillor Br Ricky Laguda and Brother Visitor David Hawke on to the nearby De La Salle Bomana. Students at the all boys secondary school lined up alongside the front gate to welcome Br Robert with Young Lasallians from the Bomana community joining in a traditional dance as the Superior General walked alongside Principal James Ume into the school hall. Some of the traditional dancers officially welcomed Br Robert in local languages to a school which traces its origins back to a group of pioneering De La Salle Brothers who arrived in the area from Sydney in 1946. Principal James Ume explained how that strong Australian connection lives on at the school today as he paid tribute to the volunteers from De La Salle Malvern who help with building and maintenance projects at the school every year. In a speech to the students, the Superior General urged the boys to consider becoming De La Salle Brothers, saying it was a pivotal way of giving thanks to the Brothers for providing a high quality education. Listening to the speech was Br John Francis Gari, himself a graduate of De La Salle Bomana in 1995 who had decided to enter the novitiate because of the profound impact the school had had on him. "It is such a privilege to welcome the Superior General to our country", Br John Francis explains. "It helps to awaken our commitment to the Lasallian charism, bringing a real sense of optimism as we look to expanding that mission to the more remote provinces, well beyond Port Moresby". One De La Salle Brother at the forefront of that effort is Luke Warvanuk who travelled from Mount Hagen to meet the Superior General on his visit to PNG. A graduate of Holy Trinity Teachers College, Br Luke has a passionate commitment to addressing inequity in education in his home country. "There is a genuine lack of resources in the more remote schools in PNG and we're trying to address that through Twinning programs across the District", he explains. "It will allow Australian and New Zealand schools to share, not only financial resources but professional development and support to fellow Lasallian schools and teachers colleges in PNG". Alongside Br Luke during the Superior General's visit have been a group of committed Lasallian partners who have travelled from some of the other more remote PNG provinces to witness the historic event. This includes one of Br Luke's colleagues at Holy Trinity Teachers College, Elizabeth Oga who like Br Luke, is a member of the PNG Mission Action Committee. Another committtee member is Schola Manembe, the Project Officer of the Lasallian Remote Schools Support Service in East Sepik Province. She has played a pivotal role in the establishment of the service-a key element of the broader effort to expand the Lasallian mission in PNG. Working with the Lasalle National Office in Mount Hagen, Schola has been developing teaching and learning resources for remote classrooms and in many cases, using smartphone technology to help teachers access what they need. "A growing number of schools in the remote parts of PNG are wanting to join the Lasallian family and so we've started to run formation programs to help introduce them to Lasallian concepts in education", Schola explains. Schola is working with a number of primary school principals on the project, including Aloysius Jalapuin, Principal of Ibab Primary School and Lasallian Family Area Coordinator for East Sepik Province. The PNG Mission Action Committee has focused a lot of its efforts on expanding the reach of the Lasallian mission both through the Remote Schools Project and through working more closely with the National Catholic Education Office. 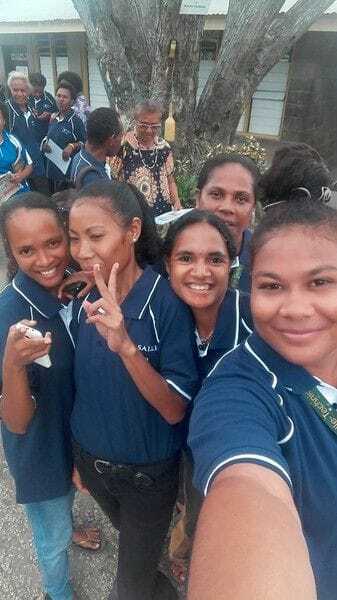 The Secretary for Catholic Education in the Kimbe Diocese in New Britain Province and a PNG Mission Action Committee member, John Silpaga says great progress is being made on promoting the Lasallian charism in remote areas, across elementary, primary and secondary schools. The Brother Superior also took time during his visit to Bomana to meet with a Lasallian veteran and Benefactor of the Institute, 85 year old Leo Maia. A former Principal of De La Salle Bomana, Leo still lives very close to the school and plays an active part in Lasallian events. Following the visit to Bomana, Br Robert Schieler attended a meeting of the PNG Mission Action Committee in Port Moresby. The committee brings together representatives from PNG schools and teachers colleges from around the country, as well as Young Lasallians and key figures from the Lasallian Mission Council and District Council. Br Robert's visit to Port Moresby also included visits to Jubilee Catholic Secondary School and La Salle Technical College at Hohola. Jubilee has a proud tradition of academic excellence, stretching back to its foundation in 2000, with many of its students going on to tertiary studies in PNG. In an address to students and staff, Br Robert paid tribute to the dedicated teachers and lay partners who have helped make the school such as success based around the Lasallian principles of Faith, Service and Community. Br Robert was presented a gift by Jubilee's veteran Principal and committed Lasallian, Bernadette Ove before departing for a visit to nearby La Salle Technical College. The college is widely respected for its vocational training programs across areas such as carpentry, automotive mechanics and hospitality. After a welcome led by traditional dancers from Milne Bay, Br Robert, Br Ricky and Br David Hawke were given a tour of the college's workshops by its Principal Br Antony Swamy. While the Superior General's visit on this occasion was confined to Port Moresby, Lasallian students from other regions of PNG flocked to the capital to welcome him. This included current students and graduates from Mainohana Secondary School and students from Kabuna Primary School. A combined event for all the students and staff was hosted by La Salle Technical College which featured traditional dances from students from Madang Province and from the New Guinea Islands. Br Robert and Brother Visitor David Hawke presented certificates at this event to educators committed to Lasallian education for ten years or longer and that was followed by a meeting with members of the Lasallian family who shared their joys and challenges working in remote parts of Papua New Guinea. The visit has highlighted the great zeal and dedication to the Lasallian charism across schools and teachers colleges in PNG and the tremendous hope and optimism in an expanded mission to new provinces in the months and years ahead. It has also captured the attention of the PNG national media, reflecting how well respected the Lasallian mission is in Papua New Guinea.